The biggest full moon of the year, a so-called “supermoon,” will take center stage when it rises this weekend, and may interfere with the peak of an annual meteor shower created by the leftovers from Halley’s comet. The supermoon of 2012 is the biggest full moon of the yearand will occur on Saturday (May 5) at 11:35 p.m. EDT (0335 May 6), though the moon may still appear full to skywatchers on the day before and after the actual event. At the same time, the annual Eta Aquarid meteor shower will be hitting its peak, NASA scientists say. “Its light will wash out the fainter Eta Aquarid meteors,” NASA meteor expert Bill Cooke of the Marshall Space Flight Center told SPACE.com in an email. Still, Cooke said there’s a chance that the brightest fireballs from the meteor display may still be visible. A supermoon occurs when the moon hits its full phase at the same time it makes closest approach to Earth for the month, a lunar milestone known as perigee. Scientists also refer to the event as a “perigee moon,” according to a NASA video on the 2012 supermoon. That’s exactly what will happen on Saturday, when the moon will swing within 221,802 miles (356,955 kilometers) of Earth — its closest approach of the entire year. Because the moon’s orbit is not exactly circular, there is a 3-percent variation in its closest approaches to Earth each month. The average Earth-moon distance is about 230,000 miles (384,400 km). 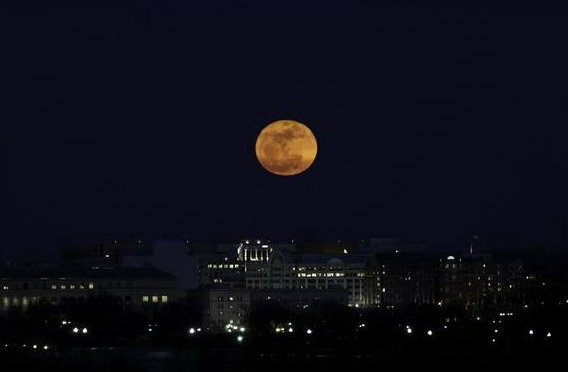 With May’s full moon timed with the moon’s perigee, it could appear 14 percent bigger and 30 percent brighter than other full moons of 2012, astronomer Tony Phillips explained in a NASA video. There is absolutely no chance the supermoon will threaten Earth. While the moon’s extra brightness during the supermoon may wash out some of the fainter Eta Aquarid meteors, all is not lost, Cooke said. Cooke anticipates that the 2012 Eta Aquarid meteor shower will peak at up to 60 meteors per hour on May 5. The eta Aquarid display is one of two meteor showers created by dust from Halley’s comet (the Orionid shower in October is the other). It occurs every April and May when the Earth passes through a stream of debris cast off by comet Halley during its 76-year trip around the sun. The eta Aquarid meteor shower of 2012 actually began on April 19 and ends on May 28, but its peak is in the overnight period between Saturday and Sunday (May 5 and 6). “Meteor watchers in the Southern Hemisphere stand the best chance of seeing any meteors,” a NASA advisory from the agency’s Jet Propulsion Laboratory explained. If you snap an amazing photo of the supermoon of May or the Eta Aquarid meteor shower and would like to share it with SPACE.com for a story or gallery, send photos and comments to managing editor Tariq Malik at: tmalik@space.com. I was given this following data by a person interested in moon calender gardening and have no idea of the source or accuracy: but the stuff about supermoons may be of interest if its factual. In this instance it relates specifically to Queensland, Australia. “The moon does an 18.6 year cycle. A supermoon is a new or full moon which occurs when the moon is at 90% or greater of its perigee approach to earth. An extreme supermoon is when the moon at new or full is at 100% or greater mean perigee (closest) distance to earth. 1955 floods: There was an extreme supermoon at Full Moon on 10 Nov 1954. Flooding occurred from Oct 1954 to 23 Feb 1955. 1974 floods: There was an extreme supermoon at Full Moon on 8 Jan 1974. 3 weeks of rain up to 29 January 1974. 1992 floods: There was an extreme supermoon at Full Moon on 19 Jan 1992. Prelude of things to come?? ?